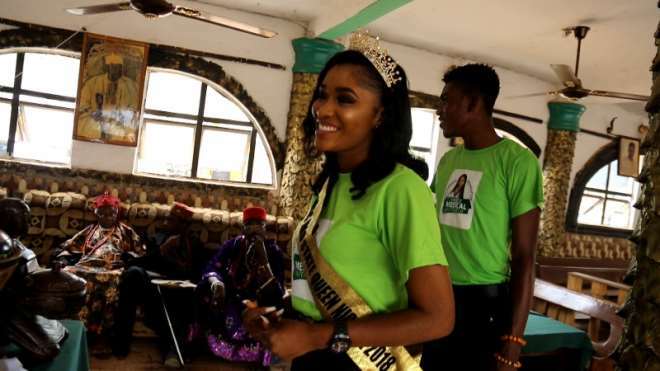 Queen Joy Chinonye Olebu who is the Miss Imo State Queen Nigeria 2018 has embarked on a free medical outreach to sensitize people of Orsu Local Government Area of Imo State on the importance of healthy living. The event which took place on February 7, 209, is part of the health projects of her JoyChinonye Foundation provided free screening and counseling on HIV, Malaria, Diabetes, High Blood Pressure and Hepatitis B and C.
It kicked off with visits to the traditional rulers of the Local Government Area, before the main event at the LGA Secretariat. Speaking at the event, Queen Joy Chinonye Olebu said the ignorant people are those who ignore ways to achieve healthy living, adding that it often doesn’t cost much to maintain that standard. Aside the screenings, counselling and drugs that were administered, everyone felt loved which gave me a sense of fulfillment. They will go home knowing that they are loved and cherished”, she said. One of the beneficiaries Mrs. Patricia Onyeudo said she is happy with what was going on, calling out the founder, Queen Joy Chinonye Olebu as a proud daughter of Orsu Local Government Area. Filled with joy, Queen Olebu thanked everyone who made the event a success, praying that God will bless them all. “I want to seize this opportunity to sincerely say a very big thank you to all our partners: Imo SACA, LACA, SFH, Pacalian B Mega Concept, our media partners and all the volunteers for their contributions towards the success of this programme, may God almighty bless all of you” she said. Having bagged the award of the best Pageant Queen of the Year in 2018 from Ultimate Kings and Queens Event Management, Queen Joy Chinonye Olebu will be handing over as Miss Imo 2018 in April 2019, with legacies of humanitarian projects such as Arise Girl Initiative (A Girl Power Dance Programme), visit to Imo State Prisons, Awareness on Hepatitis B amongst others carried out through her Foundation.